I was in the market for a new gadget that 'makes life easier' by combining multiple functions into one- and the iPhone, Nokia N770 or my laptop didn't seem to be able to do all of this. Ok- I really wanted a new toy to play with so I picked up a Mylo2. Just to be forward, this is going to be a very negative review of the Mylo2. I went in expecting an awesome device and lots of little things kept cropping up that made the device seem more like a Sony-Ericcson Sidekick competitor that was over development budget and then was never finished. The Mylo2 is a toy- that's about it. It is a woefully crippled device due to the lack of integrated 3G/EDGE/GSM connectivity, the omission of Bluetooth support (to allow pairing with a 3G/EDGE/GSM device) and a pitiful amount of RAM. Add onto this Sony decided that an eMail client is not necessary as everyone uses webmail and you have the Mylo2. Oh, did I forget to mention that they have a proprietary headphone plug on the unit? An included 'hands free' cable coverts the plug into a standard 3.5mm headphone jack, but suppose I don't want this clunk of wire on there when using it? Take a lesson from your own PSP Sony! The unit MUST have WiFi to work. Sony is good enough to give us access at 'over 10,000 hotspots' included (9000 of those are McDonalds- not exactly my restaurant of choice) with the device, but this does little good when on the road or at the office (unless your office has its own WiFi). There is no Bluetooth on the device so you also cannot pair with a phone to use the data plan on that device. The WiFi wizard is pretty decent and it does a good job of connecting to known WiFi networks when in range. The Mylo2 supports 'widgets'- which so far consist only of a Facebook app, a YouTube player, a Google search and some other app that I forgot- the development community has not embraced the Mylo2 yet. The camera is a 1.3MP phone camera- it works Ok outside in direct sunlight but gets worse as the light drops. There is no video record feature on the unit (???). This will not be a replacement for a point-and-shoot camera as it has no flash or 'focus'. The Skype and the IM clients work pretty well (save for crashes and 'our of memory errors') but Sony also has released a Skype client for the (slim) PSP- so why would I spend $300 on a Mylo2 for Skype when I could spend $180 for a PSP with the same functionality. (The keyboard would be an obvious reason for the IM clients, but not so much for Skype). The IM clients work, but they are a little confusing at first- opening the client shows me online with a chat box, but I must click again to open another window where the text entry occurs. The Mylo2 will play standard MP3s, WMV, AAC and Sony's wonderful (sic) ATRAC format. The unit has mass storage device (MSD) mode so files can be copied to the unit just like an external drive. Rants aside the Mylo2 has a beautiful screen (800x480) that I am guessing is the same as the one on the Nokia N770/N800/N810 models. The unit feels pretty solid and the keyboard is a definite necessity for web surfing. The Mylo2 includes Flash Lite which enables web content such as YouTube and similar sights (the iPhone must use an application specific for YouTube as it does not support Flash- yet). The Mylo2 reminds me of the old Sony Clie series- a single task device that can run thread some tasks (playing music, IM clients) as a background task. The unit is fairly responsive but lacks enough RAM to be used as anything more than a one pony show- using Skype OR web browser OR watching a move. This device my be worth about $150 as a novelty, but it is far from a laptop/UMPC replacement. If you are considering this, either get a PSP for Skype or get a Nokia N810 for web browsing/IM use. Another alternative is the iPod Touch or the iPhone- but the lack of tactile keyboard on these devices is also a deal killer. Future software updates may address issues such the missing email client, but the omission of Bluetooth limits the connectivity, kills chances for A2DP headphones and makes sure the device will never be usable as a GPS device. There is a good Mylo2 unboxing over at Pockatables. There was a post on Engadget about the MyNetflix Vista MCE plugin; this allows one to watch streaming videos from Netflix (with a valid Netflix account, of course). I installed the NetFlix Instant video player (I never bothered with it before) and then installed the MyNetflix plugin. This creates a 'MyNetflix' application under programs in media center that allows me to view/add to my current NetFlix queue as well as play videos from the NetFlix Instant View selections. One other issue is that the movie does not automatically go to full screen while playing- but this may be a setting in the NetFlix player that I haven't discovered (this is the first time I have had a desire to install it). Now where is the Joost MCE plugin? Just to be safe I went ahead and made my original PSP battery into a Pandora's battery (more on that in another post). To do this upgrade, your PSP must be able to run 'homebrew' software by having its firmware already modified. There are numerous exploits to do this, but they are all specific to a certain version of firmware. The alternative to this is to find someone with a Pandora's Battery that can but the PSP into a mode where the 'golden' (i.e. 'very hackable') v1.50 firmware can be installed. Trying to directly upgrade to 3.90 M33 firmware is no good- my PSP's firmware must be v3.52 M33 r2 or higher. To do this, download the 3.52 M33 firmware creator and follow the instructions for downloading and renaming the official v1.50 and v3.52 firmwares. A quick run of the 3.52 firmware creator and there is now a custom installer on the memory stick that needs to be run (after reboot); this brings my PSP up to 3.52 M33. I also need to bring the PSP up to v3.52 M33 patch 2 or higher for the update to work; this is pretty painless and requires a reboot to work. Finally- the 3.90 M33 upgrade! This update is very well done- it downloads the official 3.90 (if not already present), creates the update, installs and all is done (be sure to follow the directions and press the 'X' when finished!). Since I have a fat PSP I also need to install the 1.50 kernel patch, and this also requires a copy of the official v1.50 firmware. Cashless society is en route... Where do I get my chip implanted? I recently purchased a Samsung YP-P2 for the sole reason that it has integrated Bluetooth supporting A2DP. My only other option with this feature appears to be the Insignia Pilot player (sold at BestBuy)- but online reviews say that the Insignia player has terrible sound quality. An 8GB YP-P2 is not easy to find in a retail store; BestBuy has the 4GB version and no other major vendor appears to carry any Samsung devices- save for Fry's which has their entire product line. The YP-P2 is $250 online and that is the same off-the-shelf price at Fry's. A bit expensive for an MP3 player, but based on it's feature set it fits right in-between an 8GB iPod Nano ($200) and an 8GB iPod Touch ($300). The box contains the YP-P2 player, a proprietary USB charging/sync cable, a lanyard/belt-clip, basic (wired) headphones, a software CD and a screen cover. The YP-P2 has four buttons, but none of them are used for device navigation; they are volume up, volume down, hold and a play/pause button that doubles as a power button as well. The volume up/down buttons are a GREAT idea as this was on of my primary gripes about the iPod touch (they are included on the iPhone). The red/blue/green LED on front of the YP-P2 is not a button; it is just an LED. I was able to drag-and-drop several audio files for a quick test. Also note that the folders allow recursive scanning of sub-folders, so I can group my music as I like in the 'Music' folder and it will be accessible to the YP-P2. 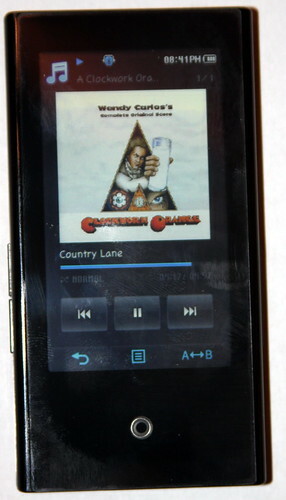 The unit supports MP3, WMA, WMA-DRM and AAC formats (after a firmware update). I tried to sync some older Logitech 'Wireless Headphones for MP3' and a Logitech 'Wireless Headphones for iPod' with no luck; it went through the pairing but came up with a 'Connection Failed' as it was finishing up. I tried my Sony BT21G headphones and I met with success. (note: after a firmware update to v3.07 I was able to connect). The sound is great; maybe even better sounding than a the stock (wired) headphones that came with my G5 iPod. The range is very good- about 10' through the various walls and fixtures in my house or 20' line of sight on my outside deck (distances will vary with different headphones). The video format is very specific to the device; trying to copy files over to the device gives a response that 'this is format is not supported by this device'; they must be converted via Samsung Media Studio to a SVI (Samsung Video?) format. The conversion is fairly quick and the resulting video quality is very good. The specifications are that the P2 supports MPEG4 and WMV9 video- as long as you have the proper codecs it will convert anything to SVI (I tested DivX/XViD, TS and HKV formats). Pictures must also be converted to a 960x544 resolution (or twice the actual 480x272 screen size- good for use with the zoom feature while viewing photos on the device). The Samsung Media studio makes quick work of this and will center and add black 'sidebars' to accommodate the 16:9 aspect ratio of the screen. The 'Datacasts' are in the form of RSS feeds that can be copied over to the P2 for reading at a later time. It also supports emedded RSS feeds such as podcasts. The newest version of Samsung Media Studio also has an option to 'Hotsync' (doesn't Palm own that word?) the 'Datacasts' so they are loaded into the P2 when it is connected. The P2 also has an FM radio that is pretty functional- save for it must use wired headphones as an antenna (so FM is not usable with Bluetooth headphones). I have not been able to find a list of phones compatible with the YP-P2 but I had success with a Blackberry 8300 and failures with a Treo 700p and an iPhone. Another note is the Bluetooth configuration on the YP-P2 only supports one device at a time- so connecting Bluetooth headphones disconnects the cell phone (you must use wired headphones for this option). Other updates are for AAC support and other miscellaneous fixes such as larger album artwork display, better touch screen sensitivity, ability to transfer files over Bluetooth, etc. Another update (v3.07) added the ability to record FM radio, games and a great deal of additional functionality; I can now delete files from the file browser; the Text viewer is much easier to read and has more functions; there are also gesture based options for picture and text viewing. I could not download the firmware directly from Samsung (the link points to the v2.08 firmware) but instructions on other web sites gave direct links for the US firmware and the games. In final review, the Samsung YP-P2 packs a lot of features into a small device. It has an excellent screen (albeit a little smaller than an iPhone) and superb sound quality. There are some minor issues but the past two firmware updates have added incredible features that were not expected but very appreciated. There is a pretty simple 'how to install' document up on sourceforge- linked from the XBMC forums. The install/setup is pretty simple and is written to work with Ubuntu 7.04 or 7.10. My initial impressions are that they are doing a great job, but it has a long way to go. Currently it is intended for developer use only, but it looks almost finished. The default build has the debug mode active and displays on-screen CPU stats (remove during build with the 'CONFIGOPT=--disable-debug' option). I tested with a Pentium D 3.0 Ghz, 2GB DDR2 system with an ATI Radeon 9600 AGP video card; the CPU was running at 95% - 110% most of the time (using OpenGL). I picked up an eVGA GeForcfe 6200 AGP card for $40 at Fry's and the CPU is in the 15%-35% ranges (peaking up into 90% with some 1080i content). HD content plays MUCH better than on the original (733Mhz Celeron) xBox , but 1080 content still has a little lag/jerkiness to it. There are some audio issues (like no sound on 2nd video play) and some problems with stopping video playback (where is the STOP button?). I also have had several freezes and reboots when trying to switch from one video to another- but this is expected as it is not even in alpha testing yet! I also have not figured out how to use my IR remote yet. Everything appears to be mouse driven on-screen only (with a few keyboard shortcuts); I cannot enter a SMB login/password via keyboard- it must be done via on-screen keyboard (which can be very unresponsive or enter random characters). The interface is true to the original XBMC and most of the features appear to be intact (such as playing DVDs from ISOs). If they manage to include TV tuner support in this I will happily switch from Microsoft Vista Media Center!